From early position, I raised to $7 or $8 with A-K. Guy three seats to my left, who had overdosed on the scented body wash and/or cologne, called. 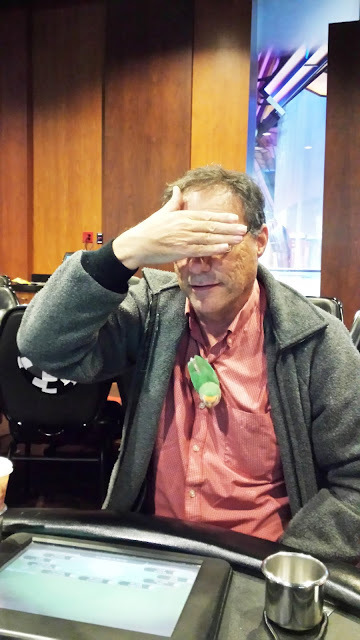 The man with the love bird moved all in for about $70 from the big blind. I was willing to call him for that much, on the assumption that he did not have aces or kings, and we would most likely be flipping. But I wanted to shut out Fragrant Man, so I moved all in myself, which was something like $400. After tanking for a while, Fragrant Man said, "Oh, what the hell," and called for about $170. Yikes. I just hoped that he didn't have any of my outs. Cards revealed: 8-8 for Bird Man, 7-7 for Fragrant Man. The flop was all bricks. No pairs for me, no draws for anybody. Turn: More of the same. It was looking grim for me. I was set to lose about $70 to Bird Man, and about $100 on top of that to Fragrant Man. But the Poker Pro circuitry took mercy on me, and delivered a king ball, corner pocket. It's nice to get a little run-good at the perfect moment. This one is all about bar poker, a venue that poses unique challenges. What's the strangest thing a player has ever brought to a poker room? I have a new answer to that question as of today, thanks to a guy who was playing at Harrah's Cherokee this afternoon with Nina and me. My awareness of this oddity began when I heard a brief, high-pitched "tweep," which Nina later correctly compared to the chirp a smoke detector makes when its battery is running low. I figured it was some sort of notification on somebody's smart phone, and didn't think much more of it. But a few minutes later I heard it again, and was better able to localize the direction it was coming from. I looked at the guy, and there is a BIRD POPPING ITS HEAD OUT OF HIS SHIRT COLLAR. Mind you, this was not a stuffed bird. It was not a toy bird. 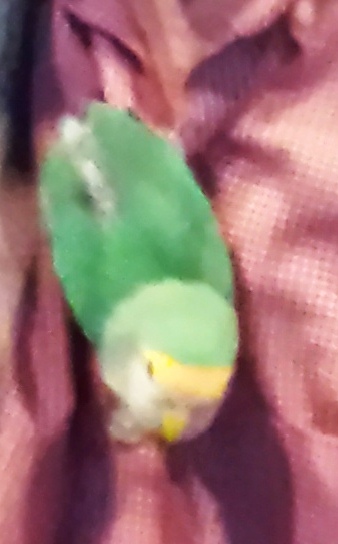 It was a real, living, honest-to-goodness pet bird--a peach-faced lovebird, to be exact. It would pop in and out of his shirt. It was out for quite a long time, sitting on his lap, as he fed it some birdseed from a little tray that he had brought along. When it chirped for attention, he would stroke and kiss it gently and talk to it softly. The bird's name is Smokey. It bit him once, and got a mild scolding, but otherwise was very well behaved. It never tried to fly away. I know what you're thinking: "Pics or it didn't happen." He gave me permission to take this picture, but for some reason wanted to partially hide his face. I wonder how many bird poops there are inside his shirt.